Researchers from Brown University have completed a new analysis of an ancient Martian lake system in Jezero Crater, near the planet's equator. The study finds that the onslaught of water that filled the crater was one of at least two separate periods of water activity in the region surrounding Jezero. "We can say that this one really well-exposed location makes a strong case for at least two periods of water-related activity in Mars' history," said Tim Goudge, a graduate student at Brown who led the work. "That tells us something really interesting about how early Mars operated." The study is in press in the Journal of Geophysical Research: Planets. The ancient lake at Jezero crater was first identified in 2005 by Caleb Fassett, a former Brown graduate student now a professor at Mount Holyoke College. Fassett identified two channels on the northern and western sides of the crater that appear to have supplied it with water. That water eventually overtopped the crater wall on the southern side and flowed out through a third large channel. It's not clear how long the system was active, but seems to have dried out around 3.5 to 3.8 billion years ago. Each of the crater's inlet channels has a delta-like deposit where sediment carried by water was deposited in the lake. In 2008, Bethany Ehlmann, another former Brown graduate student now a professor at Caltech, showed that those fan deposits are full of clay minerals -- a clear sign of alteration by water. The question of how exactly those minerals formed, however, remained open. Did the minerals form in place in the lake, or did they form elsewhere and get transported into the lake? That's the question Goudge and his colleagues wanted to answer. To do that, Goudge gathered high-resolution orbital images from NASA's CTX instrument, and combined them with data from the Compact Reconnaissance Imaging Spectrometer for Mars (CRISM) aboard NASA's Mars Reconnaissance Orbiter. Using those two sources, Goudge put together a detailed geological and mineralogical map of the entire Jezero Crater paleolake system. The map showed that each of the fan deposits has its own distinct mineral signature that matches the signature of the watershed from which it was sourced. "That's a good indication that the minerals formed in the watershed and were then transported into the lake," Goudge said. The minerals' formation and their transportation seem to have been separated by a fair amount of time. Mapping of the watershed showed a younger layer of rock that sits on top of the hydrated minerals. The crater's inlet channels cut through that layer of younger rock. That means the water that carved the channels must have flowed well after the mineral layer had formed. "What it implies is that there were actually two periods of water-related activity," Goudge said. "The earlier episode formed the alteration minerals in the watershed, then some time later you had the surface water activity that transported the minerals into the lake. At this site, those two events appear not to have been genetically related." That finding could shed light on the water story for early Mars. It's clear that Mars was once much wetter than it is now, but it's not clear that the Martian climate was warm enough to sustain liquid water at the surface for long periods. Some researchers have suggested that if the early Martian climate was cold, chemical alteration on Mars may have been driven largely by water percolating in the warmer subsurface crust. That period of subsurface activity was followed some time later by pulses of water on the surface -- potentially sourced by either snowmelt or rainfall -- during transient periods of warm temperatures. That second round of events was largely responsible for the mechanical erosion on the Martian surface. The events at Jezero seem to be consistent with that idea, the researchers say. The fact that Jezero crater records the history of two separate water events makes it an interesting target for future study. 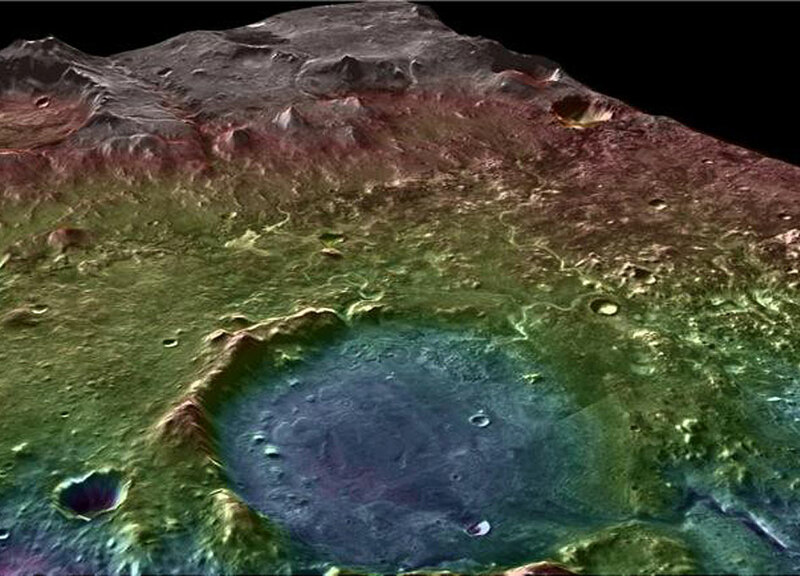 In fact, Jezero is high on scientists' list of possible landing sites for NASA's Mars 2020 rover. If life had emerged in either of the two water-related events, signs of it may well have been preserved at Jezero. "River and lake deposits on Earth are some of the best preservers of biologic signatures," Goudge said. "At Jezero, you're gathering all this material from this huge watershed and dumping into one place. So if there perhaps was any biologic or organic material in the watershed, you might have transported some of that to the basin." The water that stood in the lake from the second event does not seem to have chemically altered the rock much at all, the new study shows. That helps confirm what previous researchers had suspected: that Jezero was filled with fairly fresh water with a nearly neutral pH -- making it a potentially habitable environment. NASA held a workshop last May to start the process of selecting sites for the 2020 rover. Goudge and his colleagues gave a presentation making the case for Jezero, and the scientists in attendance voted it as one of the top five landing site candidates. There are several more rounds of the selection process to go, and Goudge hopes Jezero will stay in contention. "We think Jezero has a really interesting story to tell," Goudge said. "It would be a fun place to get to drive around in."